The essence and wording of the new Scottish Government Health and Social Care Standards (2018) highlight the central place of human rights for those accessing services within health and social care in Scotland. A focus on the outcomes people experience is a core focus of a human rights approach. On the map you will see that there are different areas or landmarks, for example ‘sea of inclusion’, ‘cove of protection’. 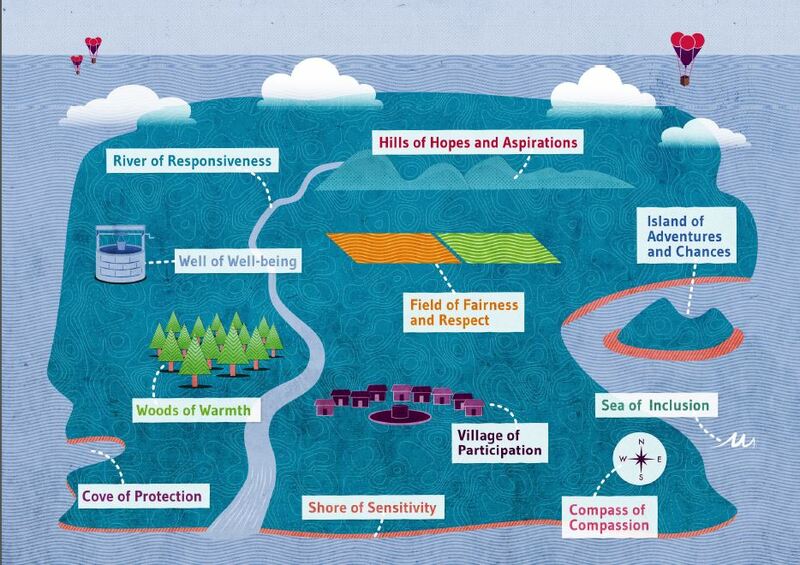 Each of these areas or landmarks correspond to central principles within the Health and Social Care Standards. The map has been created as a visual way of representing these principles, and as a template for thinking about how we might describe what people are experiencing when human rights are being met. This map was first used at an event called ‘A RIGHTs Blether’, which was a one-day workshop in May 2018 exploring human rights in care homes using stories. The workshop was developed and facilitated through collaborations between My Home Life, the Health and Social Care Academy (a programme of the Health and Social Care Alliance Scotland) and Life Changes Trust.